Yesterday, Tom and I had one of the best meals of our lives: lunch at BARE Vestland, in Bergen, Norway. We’d read about the restaurant in the New York Times recently, and with a free day in Bergen decided to take advantage of the noontime hour. Bergen, the second largest city in Norway after Oslo, sits on a peninsula on the country’s southwestern coast. It is by far the most urban place we’ve visited and has a distinctly coastal and also industrial feel. It boasts an historic city center and a thriving fish market, and is surrounded by seven mountains, or fjellene. After taking the funicular to the top of one, Mount Fløyen, Tom and I left the kids with the rest of the family and headed back down the steep face. First stop, Det Lille Koffe Kompaniet. Run by a mother and daughter who bore a striking and beautiful resemblance to one another, Det Lille was the best cup of coffee I’ve had on this trip so far. Raccoon, in Alesund, and a tiny stand in Amsterdam on day 1, were solid seconds, but Det Lille, you are doing it right and with charm. Three lovely cakes still in warm, aged springform pans sat on the counter. A man had just delivered them from a nearby kitchen. They looked as if they'd just sprung from Nanny's oven. I ordered a slice of the pistachio almond cake but when the mother went to cut it, she found it wasn't quite done. We shared a laugh, she refunded my money, and the man wrapped the cake back in its pan and outer layer of foil and hurried it back from whence it had come. This would never, sadly, happen in America. I loved every moment. As it turns out a slice was $9 US so I probably didn't need it that badly. Norway is stunningly expensive. As we sipped and sighed happily, we strolled through Bergen’s Bryggen area and made our way to Vågsallmenningen, near Fresco Hall. Three steps down to a door in a subtle exterior and through into a dark, sleek yet cozy interior. Bare Vestland is a hyper-locally sourced small-plate establishment. And it offers an extensive selection of beer, which felt as if they’d be perfect matches with the menu. I chose a Porter style and Tom a Saison, both made by 7 Fjell bryggeri. They were sublime. To go alongside them we ordered the: sourdough bread and oxtail butter; radishes, turnips, and tarragon cream; lightly smoked fish with cauliflower, lemon, and dill; chicken confit with broccoli and lovage; and Plukkfisk, a Bergen specialty of mashed potatoes whipped with white fish and topped with bacon and leeks. Each was a revelation. Every bite was better than the last, and we cleaned our plates. 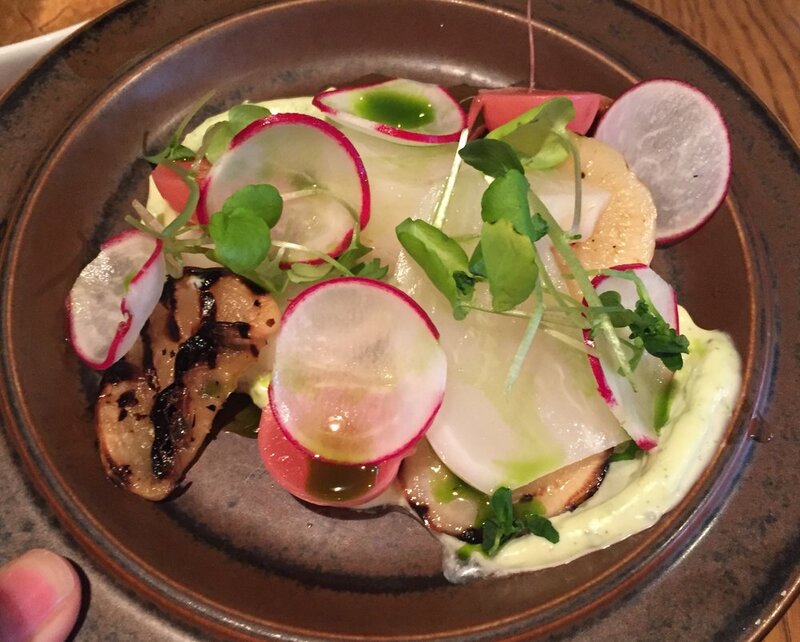 The turnips and radishes were bright, tangy, devoid of bitterness and fibrousness; utterly fresh and of the season. I wanted to bathe in the tarragon cream. The fish was so lightly smoked that the center of each piece was raw. The exterior was speckled and shimmery from heat, the whole like a work of sashimi art. Green dill oil slicked it elegantly. The chicken confit was sublime: tender, moist, completely chickeny in the best way (it was a local organic chicken). And the Plukkfisk was of the gods. Highbrow comfort food that I will most definitely be replicating. Stuffed, we nonetheless ordered dessert: almond cake with strawberry, rhubarb, meringue, and sour cream. Truly, we were blissed out. While Bergen had some lovely sights, it didn't speak to my soul in any way except at BARE Vestland, where food and the love of preparing it thoughtfully and with great attention to detail and locality gave me a marvelous sense of place and character.